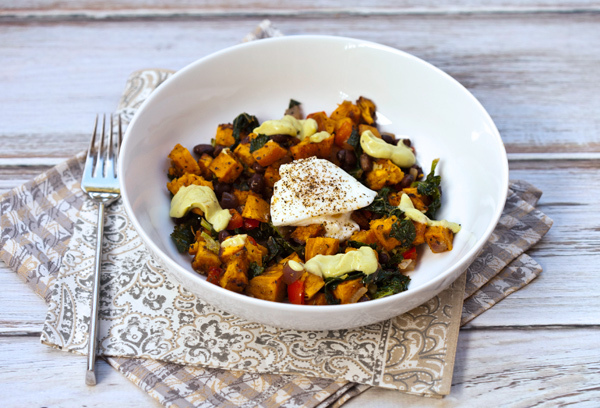 Ever since we began our switch to a more plant based diet, we have been adding more sweet potatoes into our weekly menu plans. 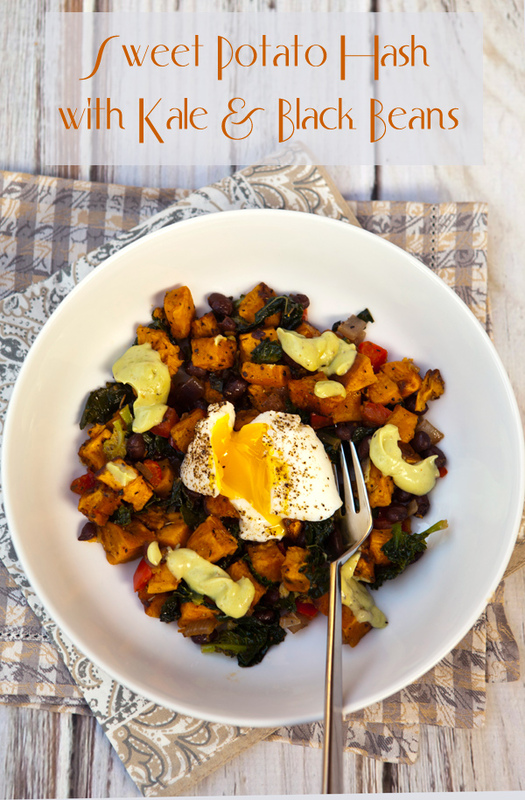 Recently I decided to create a one pan sweet potato hash to which I added kale, red peppers, onions, and black beans. 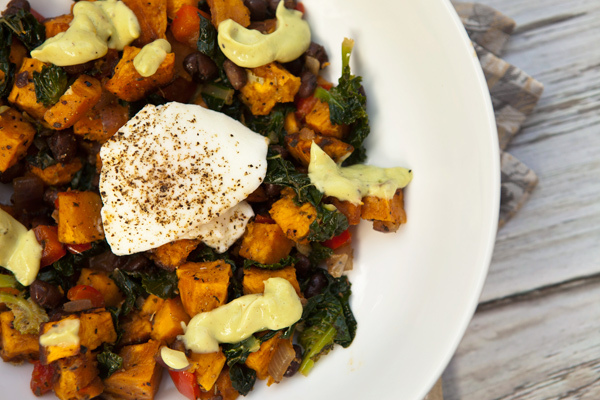 This was a very hearty, filling dish dish, but just to ensure it was protein packed, I added a poached egg on top of each bowl of hash before serving. You can play around with the ingredients to suit your own taste. You could add a mix or green, red, and yellow peppers in place of the red one I used, or you could add corn kernels into the mix as well. To spice my hash I added smoked paprika, cumin, chopped chile pepper, and some ground chipotle pepper which gave the dish a Mexican feel. You could of course, use any of your favorite seasonings which would change the entire flavor of the dish! I like to garnish dishes like this one with a dollop or two of Greek yogurt, or the guacamole cream as seen in the photos. This just balances out the heat and adds a new texture dimension. Toss the sweet potatoes in 3 tablespoons of the olive oil and season with salt and pepper. Spread the potatoes across a baking sheet and roast until fork tender and just beginning to brown, about 20 minutes. In a large frying pan, heat the remaining olive oil over medium heat and then cook the sweet and hot pepper, and the onions until tender, about 5 minutes. Add the kale and cook another 2 to 3 minutes or until the kale has wilted. Add the black beans, paprika, cumin, and chipotle pepper, and mix well. Add the sweet potatoes into the pan and mix. In a blender, add the cubed avocado, lemon juice, olive oil, salt and pepper. Pulse, then begin to add the water until the sauce is has loosened enough to pour. When ready to serve, heat the hash over medium heat until it is piping hot. 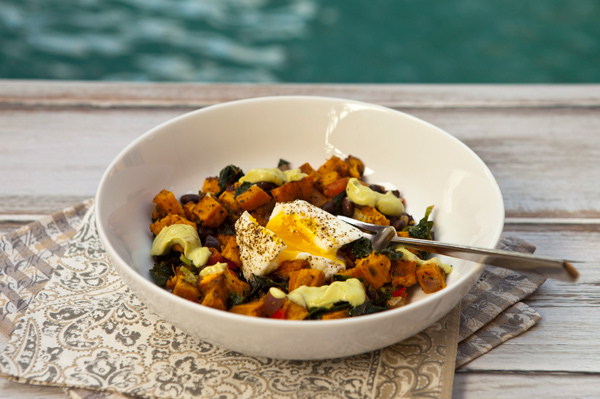 Serve the hash in individual bowls, topped with a poached egg. Dollop some of the avocado cream around the bowl, then serve.